The Law Foundation of Ontario has provided millions of dollars in funding to train, engage, support, and work with trusted intermediaries to advance access to justice. 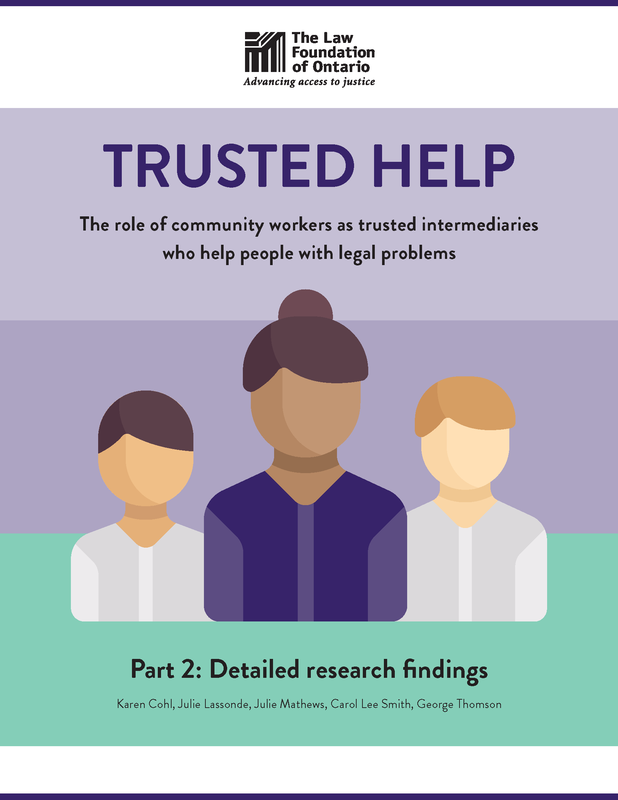 Trusted intermediaries are frontline workers who people in the community turn to for help. People may come to a trusted intermediary for help with a housing issue, for settlement support, or for other services. These frontline workers may recognize that a person’s problem has a legal dimension or, once trust is built up between worker and client, the client may ask for help with their legal issue. In 2016, we selected a team to conduct research to help us better understand trusted intermediaries and the ways in which they could be supported to help advance access to justice for their clients. The report shares the findings from a literature review, file review, focus groups, interviews, and a survey of more than 400 people, including more than 230 frontline workers in non-legal organizations. The report provides insights into what trusted intermediaries are doing and how comfortable they are doing it. The 231 frontline workers who took the time to respond to our survey indicated that most common activity is to provide referrals to legal service providers (93%) followed by providing basic information about legal rights and procedures (88%). 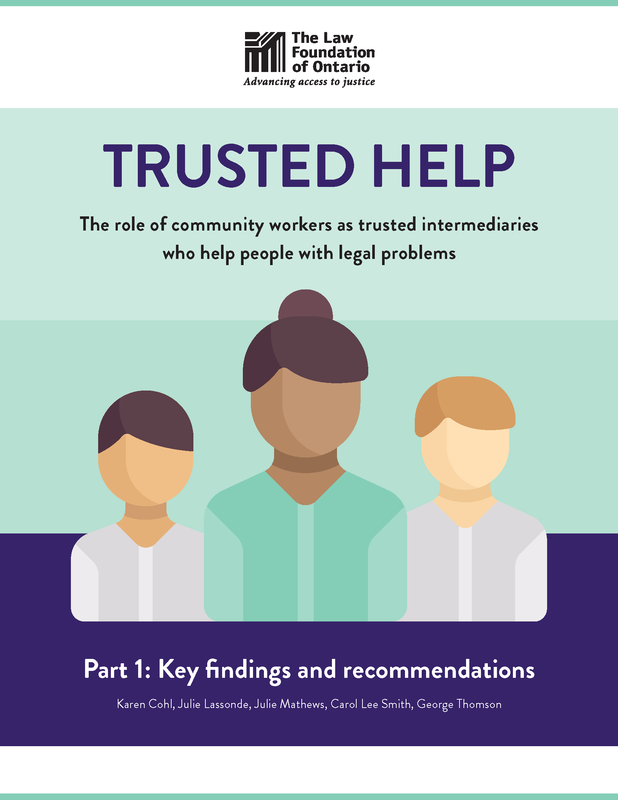 Trusted intermediaries play an important role in helping people access justice and/or legal support. Trusted intermediaries build trusting relationships, offer much needed support, and “provide vital service with inspiring commitment”. They are eager to participate in training and receive supports so they can, in turn, help those who turn to them. Trusted intermediaries provide people with legal information, make referrals to legal services, help clients fill out forms, and accompany people to meeting with legal service providers. Community workers can’t give legal advice, but they can and do help people better understand the law and navigate the legal system. Legal clinics and other legal practitioners have formed productive partnerships with trusted intermediaries and support their work in a variety of ways. Nonetheless, trusted intermediaries often have trouble finding legal professionals to help them and their clients. More can be done to link community organizations and trusted intermediaries to legal service providers. Connections, partnerships, and collaboration are key to advancing access to justice. The Trusted Help report will service as a launching pad for action. We will be sharing what we learned about trusted intermediaries, and how best to support them, with a wide variety of stakeholders and evolving our own approaches to grantmaking to trusted intermediaries projects.